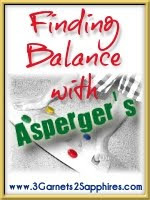 I am proudly announcing the addition of a new series to 3 Garnets & 2 Sapphires called Finding Balance with Asperger's. One of my writers, who also authors the series Living Green With Jerinda, recently received some life-altering news regarding her youngest son. As a site that has a strong focus on learning, I am honored to have Jerinda share her experiences as a parent of a child with Asperger's Syndrome with 3G2S readers. And now a few words from Jerinda . . .
After months of suspicion, my 4-year-old son, Quinn, was diagnosed with Asperger’s Disorder in June along with Generalized Anxiety Disorder and a minor fine motor delay. While the diagnosis of Asperger’s was not a shock to us, it’s still been hard coming to grips with having it on paper. Suspecting it and seeing it from a professional are two completely different things. Nonetheless, we are moving forward with Quinn and getting him occupational therapy (OT) and he’s seeing a psychologist along with our entire family. Along with getting therapy, Quinn will be needing many therapy supplies and toys, so 3G2S is starting a new series, "Finding Balance with Asperger's". In this series I will be highlighting any therapy tools we are lucky enough to review and let you know how Quinn likes them and how helpful they are for him. I hope this series will help others with children on the Autism spectrum to find products that are useful to them and hopefully we will host some giveaways for ASD parents and children. Having a child with Asperger’s forces you to think about parenting in a completely different way. I hope that my stories about Quinn, as well as my reviews for products, will help people understand children with Autism Spectrum Disorder a little better and hopefully open some eyes to the best ways to deal with children on the spectrum. Autism affects so many children now that chances are good that at some point you’ll be dealing with a spectrum disorder in someone you know and hopefully you can be prepared. To learn more about Autism Spectrum Disorders, you can visit Wikipedia or Autism Speaks. I also recently came across a really amazing article that puts ASD in a way that is brilliant and unique and I highly recommend it to anyone . . . "A hair-dryer kid in a toaster-brained world" on the blog MOM-Not Otherwise Specified.